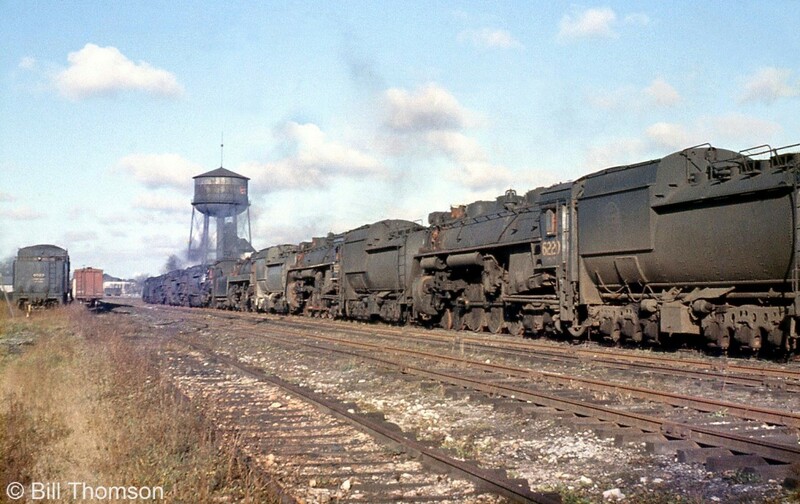 Railpictures.ca - Bill Thomson Photo: In a sad sight common during the end of the 1950′s across the country, old steam engines that have rolled their last miles sit in the scrap line at Stratford in 1959, awaiting the inevitable fate of the scrapper’s torch. Most appear to be U-series 4-8-4 “Northerns” (including 6220 closest to the camera, a U2g built by MLW in 1942), which were a larger model that was popular on CN in freight and passenger service. To get an idea of just how compelling the efficiencies and benefits of dieselization were to railways, some of CN’s newest Northerns built in 1944 were barely 15 years old when they were retired, relatively young for a steam engine. CP’s newest Selkirks built in 1949 were retired at only 10 years of age. While a few steam engines escaped the scrapper’s torch via donation to museums, displays, sale to private groups or individuals and use in excursion service, the vast majority were unceremoniously cut up for scrap in the late 50′s and early 60′s. Stratford Shops, one of CN’s major steam locomotive erecting backshops capable of overhauls and heavy repairs to the biggest of the big, was also closed at the end of the steam era. | Railpictures.ca – Canadian Railway Photography – photographie ferroviaire Canadienne. Caption: In a sad sight common during the end of the 1950's across the country, old steam engines that have rolled their last miles sit in the scrap line at Stratford in 1959, awaiting the inevitable fate of the scrapper's torch. Most appear to be U-series 4-8-4 "Northerns" (including 6220 closest to the camera, a U2g built by MLW in 1942), which were a larger model that was popular on CN in freight and passenger service. To get an idea of just how compelling the efficiencies and benefits of dieselization were to railways, some of CN's newest Northerns built in 1944 were barely 15 years old when they were retired, relatively young for a steam engine. CP's newest Selkirks built in 1949 were retired at only 10 years of age. While a few steam engines escaped the scrapper's torch via donation to museums, displays, sale to private groups or individuals and use in excursion service, the vast majority were unceremoniously cut up for scrap in the late 50's and early 60's. Stratford Shops, one of CN's major steam locomotive erecting backshops capable of overhauls and heavy repairs to the biggest of the big, was also closed at the end of the steam era. An image like this conjures up imaginations of 6060 doing 90mph with a stream of green and gold behind her; and the wonder why railroads bottom lines have caused them to completely abandon their history. Even if they skipped the complexities of a fan trip, and put 20 empty box cars for a trip down the Fraser Canyon…………or anywhere.